I’ve never done yoga before. Where should I start? What if I am injured? Congratulations on your decision to begin a yoga practice! We recommend that nearly everyone start with the Classic 26&2 hot yoga. This practice is designed for both beginners and experienced students. The heat helps aid flexibility and the postures are accessible to everyone – even people recovering from injuries – with very few modifications. This practice is balanced, moves at a moderate pace, and will leave you feeling terrific! The only people for whom we do not recommend starting with the 26&2 are people who are pregnant, people with medical conditions that are triggered or worsened by heat, and people with un-medicated high blood pressure or untreated heart conditions. If the 26&2 is not accessible to you because of one of the conditions listed above, or you are seeking non-heated yoga specifically, we recommend that you begin with Yin Yoga or Restorative Yoga. Full class descriptions are here. Please follow your physician’s guidance with regard to any form of exercise, and be sure to let your instructor know about any injuries or conditions that may affect your practice. Are all of your classes hot? We offer both hot and non-heated classes. Classes on the schedule in the Hot Room vary from 98 to 105 degrees, depending on the practice. Classes on the schedule in the Blue Room are typically between 74 and 80 degrees. Hot classes include the Classic 26&2 and 26&2 Express, Inferno Hot Pilates, and Hot Vinyasa. 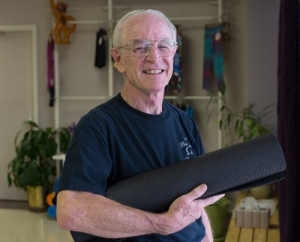 Non-heated classes are Restorative Yoga, Yin Yoga, Slow Flow Vinyasa, and SB Barre. Learn more about the classes here. The heat in a hot yoga class enhances circulation to the muscles, and makes the muscles more elastic and less susceptible to injury. The warmer temperatures in a hot yoga class produce a more fluid stretch, allowing for greater range of motion. Cold muscles don’t absorb shock and impact as well and do not stretch as easily so cold muscles get injured more readily. Classic 26&2 and 26&2 classes (Bikram Method) are heated to 105 degrees with 40% humidity. Hot Vinyasa and Inferno Hot Pilates are typically between 96 and 98 degrees with slightly higher humidity. Daily practice is recommended. Practicing your first 30 days as close together as possible is encouraged. That said, every class brings great benefits! What if I am not flexible or athletic? What if I am overweight? Every one of our classes – even hot yoga! – is suitable for people of any age, any shape. You come to a yoga practice to gain flexibility! What about chronic injuries or pain? Please arrive early and inform the instructor of any injuries, illnesses, or other issues so that we can do our best to let this hot yoga practice serve you. Can I practice hot yoga while I am pregnant? Practice during the first trimester is not recommended unless you’ve had a strong, regular practice of this yoga prior to pregnancy. Please discuss this exercise with your physician prior to attending class. Please inform the instructor if you are pregnant and we will guide you through the modified postures. Wear light, comfortable clothing that feels good to stretch and sweat in. Tank tops and shorts are recommended for hot classes. Additionally for hot classes, be sure to bring a change of clothes for after class. Showers are available. Do you play music during class? Use of music varies depending on the style of the class. 26&2 classes do not include music. It’s our foundational practice, free from distractions such as photos, altars, and other decorations. Other yoga classes may include ambient music at the instructor’s discretion. That said, we love music and a party atmosphere! Inferno Hot Pilates and SB Barre are loud and fun, with a strong beat to keep you going. Should I do anything to prepare for class? Drink plenty of water and avoid eating for 2-3 hours before class. Please bring a yoga mat and a large towel to place over the mat, and water to drink. Mats and towels are available to rent at the studio and water is available for purchase. But, most important, bring an open mind and your sense of humor! Can I bring any props into class? In the 26&2, the majority of students have everything they need without any external props. However, we do occasionally recommend the short-term use of props during recovery from certain injuries. Please speak with your instructor before class about the use of props. We have props available for our other yoga classes (which traditionally make use of them), however you are welcome to bring your own if you prefer. Do I need to sign up before class? No reservation or pre-registration is required, however for safety we must limit the number of students in some classes. If you want to be guaranteed a spot, please sign up in advance. Can children and teenagers practice hot yoga? Teenagers 17 and under may attend with permission from a parent or guardian. Teenagers 15 and under must be accompanied by an adult. Please contact the studio for more information. People who practice yoga are happier. It’s hard not to be happy when you feel so amazing. One of the first benefits people find in hot yoga is falling asleep easier at night and waking up feeling fully rested and restored ready to take on a new day. You will have more energy throughout your day and be better able to accomplish your daily responsibilities. Remember, your skin is the largest organ of elimination! Your body uses sweating to detoxify, and it makes your skin glow. You will feel less stressed and more in control of your time. You will increase clarity and be able to focus on the tasks at hand. If you can commit to a regular hot yoga practice with our series, you can do anything! And there is an empowerment that comes from knowing you are more in control of your health and overall well-being. Well, not really. But, you will become physically stronger and begin to carry your body differently. Your posture will improve and you will walk taller. You will become mentally stronger and will feel more confident, more focused and less stressed. Be a superhero! This yoga is healing yoga. It’s physical therapy for your entire body. When you try to perform the postures the right way, your body will begin to change and improve. You will work through old injuries and rid yourself or significantly reduce pain. As you begin to enhance the definition in your musculature and regulate healthy body weight, you will see your body take on a new more toned shape that fits better in clothes and looks better naked. Welcome to Baltimore Hot Yoga & Wellness! You’ll find classes at BHYW for every body. We offer both hot and non-heated classes. Click here for detailed class descriptions. We recommend that nearly everyone start with our Classic 26&2 (Bikram Method) Hot Yoga Series. This class is designed for true beginners and experienced yogis alike. It provides a balanced practice that builds strength, flexibility, and endurance. Our hot yoga is HOT, so come to class well hydrated. You don’t have to be in shape to try your first hot yoga class. Come as you are and give our hot yoga series a chance to work – at least five to seven classes before you decide if it’s right for you. This is why we offer such a GREAT introductory deal: 30 days of unlimited yoga for just $35! After the initial month, practicing three to four times a week is the best way to get the most benefits. The more classes you take, the sooner the benefits are coming your way. So, what are you waiting for? Come in and take your first class – be prepared to sweat like crazy and see how this yoga can change your life, improve your health, and even be FUN! As a beginner, it is normal to feel a bit intimidated. All classes are for all levels, so you will be surrounded by other beginners, as well as people who have been practicing for many years. With consistent practice and patience you will improve. It is normal to feel very challenged by the yoga. Some days you may feel a little dizzy, nauseated or even light-headed. Take care of yourself, every day will be different. Take your second class within 24 hours of your first class. Come as many times as you can in the first 30 days and you will notice a change, we promise! Drink plenty of water before your first class and between classes. Drink WAY more water than you think you should. Do not eat for 2-3 hours before class. Do your best to stay in the room. Take as many breaks as you need by sitting or laying down quietly on your mat. Come a few minutes early to get acclimated to the hot room. Stay and relax after class to get all the wonderful healing benefits from the 90 minutes of hard work you put in. Practicing a minimum of three times a week is best, but one day a week is always better then none. Thank yourself just for showing up and remember it is yoga practice not yoga perfection! Arrive 15-20 minutes before your first class. Doors are LOCKED after class begins. No shoes or socks in the hot room. No perfume or cologne! During the practice, we breathe through the nose and those around you may be sensitive to fragrance. If you are wearing perfume or cologne, please rinse off before class. Practice your stillness and discipline between postures. Do your best to stay in the room. This minimizes distractions. Take as many breaks as you need by sitting or laying down quietly on your mat. Please observe silence at all times in the yoga room, before, during, and after class. Baltimore Hot Yoga & Wellness has a lounge where you can visit with your new yoga buddies. Please do not bring extra items into the hot room. All you need is your mat, towel, and water. Collect all your belongings before you leave. Please, no phones in the hot room. For the security of you and your belongings, doors will be locked after class begins. Respect yourself, respect others. Smile, have fun, and enjoy yourself! More aware from the first breath, stronger from the first stretch! Baltimore County’s best yoga studio is Baltimore Hot Yoga & Wellness.